When freelance writers get the Christmas spirit, you get links to Christmas articles! All by me, but hey, they’re free! I can’t believe we’re already a week into December, although maybe I can a little as I’ve been writing about Christmas for a couple weeks now. 5 Christmas Traditions Around the World at BootsnAll Travel: “If you’re tired of the same old food, weather, and, ahem, people this holiday season, now may be the time for you to experience Christmas traditions from around the world.” Virtual trips to Australia, Italy, Austria, Brazil, and New York City are included free of charge. So…are you in the holiday spirit yet? You have really outdone yourself with those stories on Italy Mag. If I go back to Naples next Summer I really want to watch the presepi artists at work one again. Michelle – your blog is an inspiration! I toured through Venice down to Florence for two weeks during grad school to see first hand much of what I studied as part of my MA in Art History. Every time we go over the Renaissance in my Intro to Humanities lecture, I’m reminded of how much my girlfriend and I need to flee the States for an impromptu vacation! Found your site on CommentLuv, and will bookmark it in my Google Reader for sure! Thanks for getting me into the Christmas Spirit! I’ve always loved CommentLuv, but now I love it even more 😉 Thanks so much for your kind words, Kevin, and I hope you get to come over here for a visit soon! The same friends that I went to Camigliatello with are going to Naples this weekend. I’m sorry but it’s too crazy this weekend. Maybe I’ll go next weekend when the crowds aren’t quite so bad. I must be getting old. I can’t wait to read. Thanks for these links. You know how I feel about Christmas!! nyc/caribbean ragazza’s last blog post..Flashback Friday – Nat King Cole "The Christmas Song"
Hey thanks for this. The Christmas markets & decorations have just started appearing in Geneva. I started out with a virus weeks ago, but it seems to have left me with a ripped up digestive tract; I got some meds today, so hopefully I’ll be done with all this soon! YAY!!!! Lots of good reading! I’ll have tons of time for that next week. Finals this week, resting next week. I will get to sit and relax with caffeinated coffee; espresso, even, and your wonderful writing. I can barely wait! And yes, the Christmas bug has taken up permanent residency in my home. It’s all half up. It takes a while to get it all up. Your candle is out, though, and lit when the music is embracing, the fire is frolicking in its cage, the tree is glowing and the mugs are steaming. You are there. Aaaaah, I’m *so* there! Thank you thank you! Oh – and that is a lovely photo! What nostalgia your articles on the Neapolitan presepi has conjured up in me. I was reminded of three winters ago, when I was strolling visiting the Museo di Santa Chiara. It a sunny day and all that was needed was a light jacket. I ended my visit with an espresso and sfogliatella liscia at le Galleria Umberto I. Even just traveling back there in my mind is wonderful. thank you for yet again taking me to Italy; i’m living there now, vicariously through you! I’ll make sure to check out the reads you suggest. I love the season, it’s my favorite. I should be at church today but i decided to stay in, light candles, turn on my Christmas songs playlist and blog read. All I’m missing is the smell of pines (need to go to home depot and get some trimmings) and mi familia. ciao bella. I’d love to get to Italy NOW Michelle…beautiful post! My grandma and grandfather were Calabrese. This time of year I tend to wax nostalgic for Grandma’s house. My last name is a town in Calabria (Magisano). I enjoy your site very much. Thanks for the comment! I hope your holiday decorating is going well. My only regret this Christmas is not being able to have a real tree (there’s no room in my apartment). Instead, I bought a fake little tree and plugged into my wall an evergreen scented oil thingy. It’s an adequate substitute. By the way, I enjoyed your piece on 5 Christmas traditions around the world, especially number 5. I was at the tree-lighting this year for the first time since my childhood. It is a lovely sight. Yeah I don’t have room for a full-sized tree either, so I have a tiny one…no evergreen scent, but it’s OK. I have cinnamon pinecones! Glad you enjoyed the tree lighting! 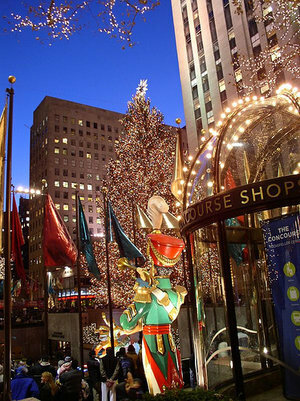 I *love* NYC at Christmas time! I want to take photos of the one in our church in the village this year as I haven’t yet; it’s often too dark for them though, but I’ll try! Great articles! I have to admit finding the political figurines a little creepy looking, but I guess the artist tried. WOW it sounds elegant, I have never been out of the country but with those great articles it will definitely help me decide where to go. I have heard that Napals is a beautiful place. I would love to go and experience a new culture other than my own thanks. .-= Tom @ Ideas For Christmas´s last blog ..History Of Christmas =-.